Product information "HI144-10 T-Logger Temperature Data Logger"
The monitoring of temperature is critical through all stages in food distribution. This includes from the times it is packed and stored to transportation to the local market or restuarant. For cold food storage it is necessary to ensure that the product is always stores properly to maintain quality and for safety to prevent bacteria growth. The HI144-10 will help to be compliant in recording temperatures as part of a HACCP monitoring program. For building maintenance, this logger can track environmental temperatures of an office or warehouse to ensure that heating air conditioning thermostats are programmed correctly and hot or cold air is disbributed evenly. Using the supplied PC software HI144-10 can be programmed to record the temperature in intervals from 1 minute to 24-hours and can store up to 8,000 readings. The HI144-10 is supplied with the HI144T Logger, USB cable, Wall Mount with Lock and Software. 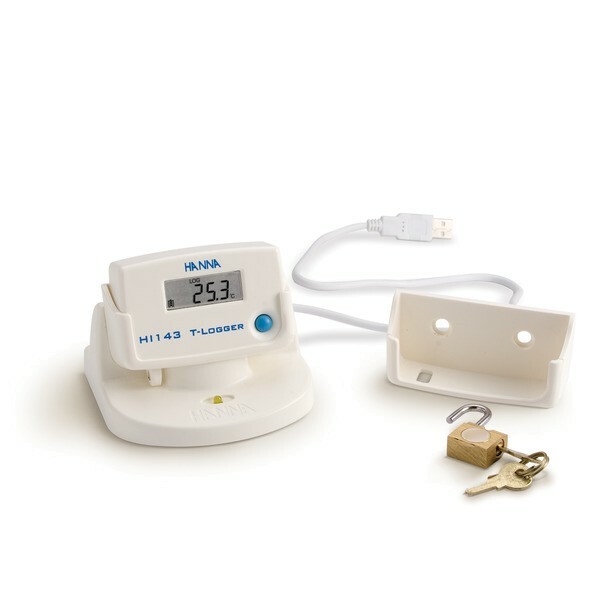 Additional HI144-T-Loggers can be ordered without the cradles and software. EachT-Logger has it's own unique serial number to identify indivudual units. Related links to "HI144-10 T-Logger Temperature Data Logger"
Customer evaluation for "HI144-10 T-Logger Temperature Data Logger"